Clio Ancient Art and Antiquities was established by Chris M. Maupin with the aim of making the enjoyment of art and antiquities from the ancient Greek, Roman, Egyptian and Near Eastern worlds accessible to the widest possible audience. Started in the San Francisco Bay Area and more recently relocated to Charlotte, North Carolina, Clio Ancient Art utilizes Mr. Maupin’s academic background in archaeology and a life long interest in ancient art. He has traveled extensively in the Mediterranean world and visited countless archaeological sites in Italy, Greece, Egypt and other countries. With 25 years collecting experience, he has consulted for museums, academic institutions and private collectors, and has established a Trust that sets aside key pieces of ancient art for donation to museums building their own collections of Greco-Roman, Egyptian and Near Eastern antiquities. We live in a world obsessed with change that seems constantly to be reinventing itself. This wasn’t always so. For most of recorded history, change occurred slowly and this was especially true of art. Only rarely, as with Greek vase painting, did styles evolve rapidly. Holding an object, however modest, from ancient Greece, Rome or Egypt and feeling a human connection to its maker can help ground us, briefly silence the din of modern life and put in perspective our own place in time. Visitors to the Clio website sometimes ask why a distinction has been made between antiquities and ancient art. The answer lies in our modern perception of what art is and how we moderns perceive the ancient past. Many of the antiquities for sale here or on display in a museum were never intended to be viewed as art. These items may have served a utilitarian purpose, and may even have been ornamented by their makers to move them beyond the realm of the ordinary, but were not viewed as “art” in their own time. “Art” is an appellation we have ascribed to these objects, partly in reverence of their age and rarity. By contrast, other pieces on this site such as Roman marble sculpture, Attic and Greek South Italian vases or Luristan bronzes were clearly designed in their own time to serve much more than utilitarian needs. Another question sometimes asked is “Why Clio?” Clio is the Muse of History and thus appropriate here. The Muses were companions of the god Apollo. Originally deities associated with springs, their number and functions changed over time but in the classical era it was finally determined there were nine Muses, each with her own unique character. Clio, whose name means “the proclaimer,” is most often depicted in Greek and Roman art with her attributes, the trumpet and clepsydra (a device for measuring time). 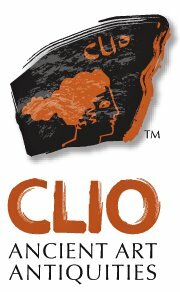 Clio Ancient Art and Antiquities is a member of the Association of International Antiquities Dealers (AIAD), a not-for-profit international association of antiquities dealers, ancient art and numismatic dealers and others keen to promote the positive aspects of antiquities ownership. The organization promotes responsible antiquities dealing and provides a support network and means of exchanging information about fakes, forgeries, misrepresentation and stolen goods with a view to identifying such items offered for sale and notifying appropriate authorities. AIAD promotes responsible trading in antiquities, which includes meeting all legal requirements concerning reporting and documentation, and its members adhere to its Code of Conduct.